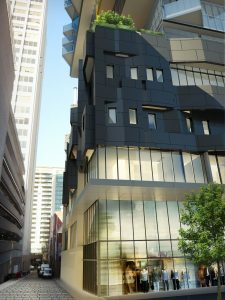 Brief: This tiny 360 sq m site in Melbourne, about half the size of an average suburban block of land, had a fourteen storey height limit which could not be exceeded unless the proposed design had “exceptional characteristics”. Our concept was to provide “gardens in the sky” to achieve a result where we had usable landscaped open space equal to almost double the site area. Every sixth floor of the tower was recessed by one third of the width of the building to provide a 100 sq m landscaped garden. Six of these, plus a larger plaza gave us approximately 700 sq m of landscaping in the sky. 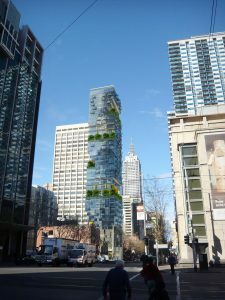 The site was on three street frontages with the sky gardens spiralling upwards so that there were gardens for three seasons. 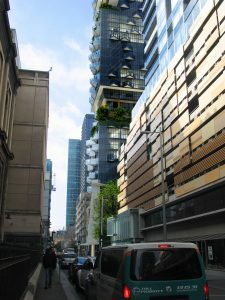 A concept was developed to harness rainwater from the facades. Projecting balconies gave the impression of a large crystal, illuminated at the top at night by sparkling lights. 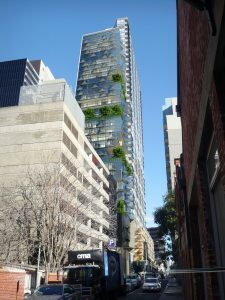 A planning permit for a 37 storey building with 176 apartments has been granted, and we hope this project will commence in 2019.